Connecting downpipes is very important as the majority of houses built in South Australia have been built on highly reactive clay soils (H1 & H2) that swell on wetting and shrink on drying, in fact Adelaide has some of the most reactive soils in the country. This is why its so important to control the amount of moisture around your home, you want to keep it at a consistent level throughout the year. This means watering around the house during periods of drought and ensuring that stormwater is connected to drains discharging to the street or into sumps. 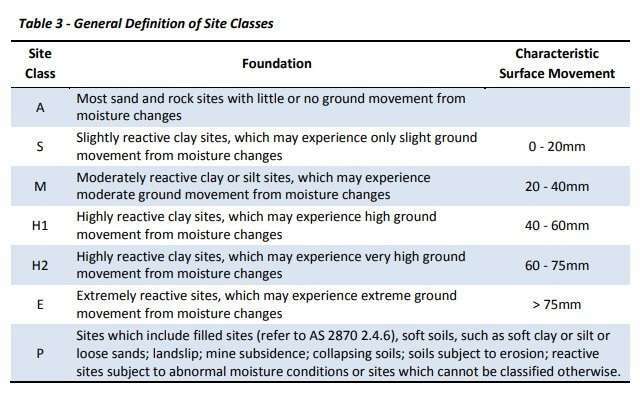 The below table shows the common amount of movement found at a site, this can be reduced simply by controlling moisture and connecting downpipes. For the last 40 years, connecting downpipes has been standard practice, however, it is common to find older houses with downpipes still discharging water adjacent to the footings. Nine times out of ten, when you inspect a house that does not have downpipes connected you will also discover diagonal cracks as seen in the video. Connecting downpipes to stormwater drains is a fairly simple process, sections of paving may need to be removed to allow pipes to run underneath and out to the street. An average cost of around $3000 should cover this process, another reason to have a pre-purchase building inspection done before buying. Leakage is also common from old earthenware pipelines, which are susceptible to damage from soil movement and tree roots. If you suspect that leakage from the drainage system is contributing to problems with cracking (soil movement) or rising damp, it may be advisable to upgrade to a new PVC system. Before considering replacing an earthenware or PVC drain, consider asking a plumber to block the pipe and do a static water test for leaks – it may be sound.